Currently in Japan for an exchange program, Sarah came to Gametize to learn more about the Way of the Ninja. By day, Sarah is a cute girl studying Information Systems in NUS School of Computing. By night, she roams the digital world as a multi-lingual ninja. From the day she was born, Sarah yearned to experience many different ways of life. It was this thirst to learn about other cultures that led her to learn Japanese as a third language for six years. Her knowledge of Japanese culture combined with her expertise in information systems makes her a fearsome ninja. On top of that, Sarah wields many ninja design tools such as Adobe Photoshop CS and Lightroom. She has taken on a wide array of top-secret missions, ranging from smithing virtual items to translating texts into Far Eastern languages. 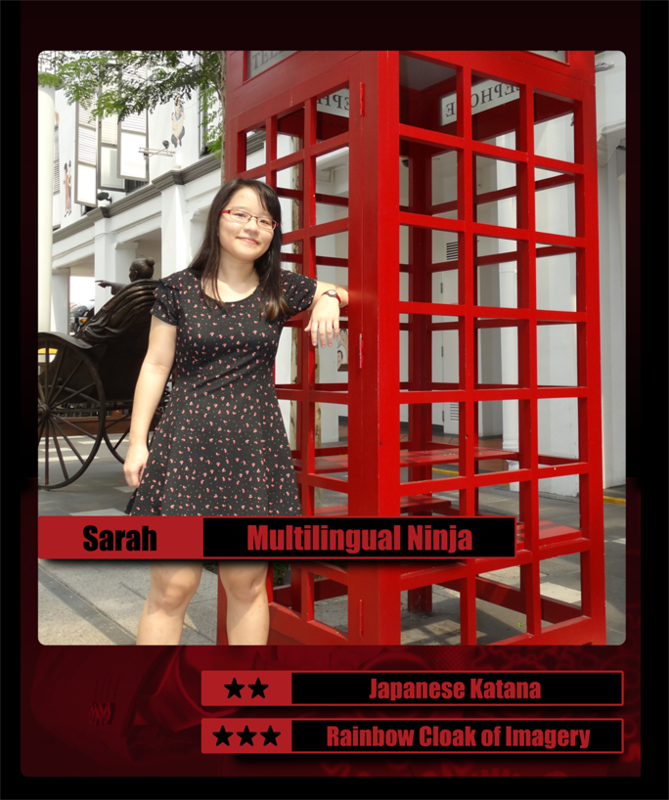 At Gametize, Sarah is working on a game that introduces Japanese Culture. She played a key role in promoting our selfie challenge app, Selfiely, in Japan.